A visit to the supermarket the other day. Firstly, I spotted this 'fearmongering for profit' packaging. It's worth mentioning that the company selling this first aid kit isn't Danish [it's 3M]and while such large companies often produce packaging for the local market, it isn't always the case. In one fell swoop they are chipping away at established bike culture by portraying this healthy, life-extending transport option as 'dangerous'. Bloody ridiculous. Why don't they feature a photo of a motorist or a pedestrian? 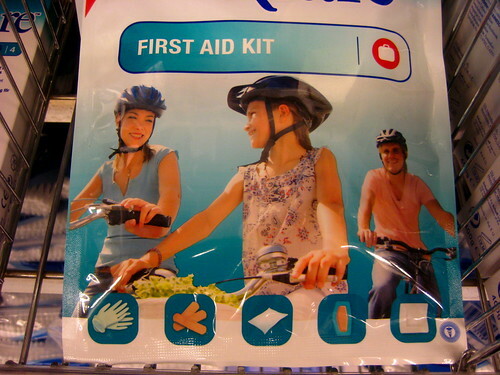 And since Copenhageners don't carry any tool kits, let alone first aid kits, on their bikes, what's the point in this stupid package? 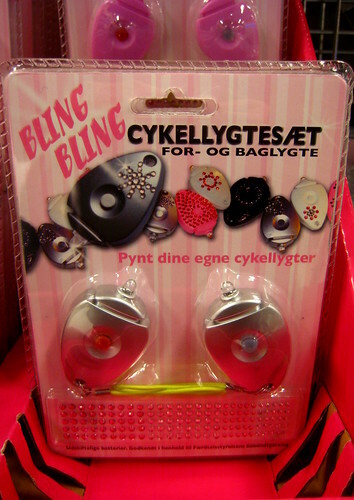 And then five metres farther along, these Bling Bling bike lights that you can decorate yourself with the shiny, sticky bits included. Marketing cycling as something fun, effortless and a part of daily life. Aimed at young cyclists, this packaging is pure, simple and positive.